Join us for free samples of smoked cheddar cooked from the brand new vegan cheese cookbook, One-Hour Dairy-Free Cheese by Claudia Lucero. We will also have vegan charcuterie boards and fresh vegan pastries available for purchase. 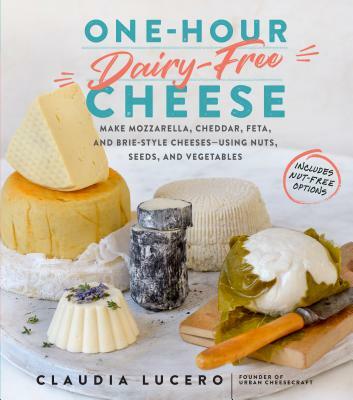 In ingenious, step-by-step recipes, traditional cheesemaker Claudia Lucero shows how to make 25 delicious plant-based cheeses using your choice of seeds, nuts, and vegetables to achieve rich flavor and creamy texture. There's buttery Golden Swiss made with cauliflower and tahini paste—and a Brie made of cashews (or zucchini and potatoes), with a bit of truffle oil to capture its earthy essence. One-Hour Dairy-Free Cheese also shows how to make spreadable cream cheese, grated Parmesan, a smoky Cheddar, and even gooey cheese sauces. PLUS, techniques for making rinds, cheese plate pairings, tips on food allergy substitutions, and a recipe to highlight each dairy-free cheese: Stuffed Shishitos, Cucumber Maki, Creamy Zucchini Noodles, Spicy Beet Salad, and more. It's a whole new way to indulge in the impossible-to-resist pleasure of cheese, no matter what your dietary restrictions are.